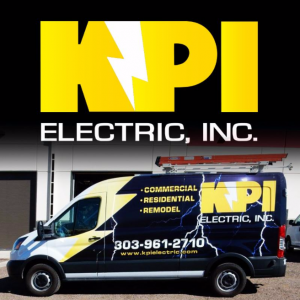 After 14 years of employment in the electrical field KPI Electric, Inc. was established in 1995. We install electrical for residential and commercial projects as well as service work. KPI Electric specializes in the installation of environmental controls for greenhouses operations around the state as well as adapting to Colorado’s industry needs and changes. We employ Signarama for all of our engraved panel labels and signage. We have recently ordered panel stickers for new service installations. Panel labeling and a truck wrap package. We find that Signarama takes pride in their work and gets the product we need to us in a very timely manner, which allows us to keep our jobs on schedule. Our target audience is the commercial general contractor as well as business owners and homeowners. We would like them to view us as a professional electrician that has their needs and their financial interests in mind. And also doing the safest and most adequate installation available to them. By utilizing the engraved plates and stickers from Signarama our customers and local inspectors are appreciative of a professional looking completed project. We have been asked several times where we obtain these labels. Our only recommendation is the team at Signarama.